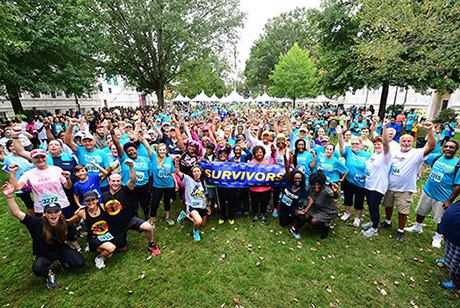 Winship cancer survivors gather on the Emory University Quadrangle after the Winship 5K. More than 3,400 runners and walkers helped to raise a record amount of money for cancer research at Winship Cancer Institute of Emory University. The 7th annual Winship Win the Fight 5K Run/Walk, held on Saturday, October 14, brought in more than $962,000. "We set an ambitious goal this year of $1 million and our supporters did an amazing job of helping to make the 7th annual Winship 5K an extraordinary success," says Walter J. Curran, Jr., MD, executive director of Winship. "This year marks Winship's 80 anniversary and the money raised at the Winship 5K will support cancer research projects that are helping to lessen the cancer burden in the state of Georgia."